We use more chemicals and waste more water in our bathrooms than in any other place in our homes! It’s time to wake up and do something to make your bathrooms more eco friendly, in the interests of our planet. Here are 30 tips that you can implement at your home to ensure your bathroom is more eco friendly. 1.Throwing old medicines into your garbage is not a good idea as animals and young kids may eat them by mistake. Don’t flush medicines either, as these will find their way into ecosystems and eventually into drinking water. Always hand over used medications at pharmacy recyclers and ask them to dispose of it properly. 2.Your old nail polish remover, nail paints, aerosols such as hairspray and leftover hair colorings are potentially toxic materials, which are hazardous and flammable. Don’t dispose those using conventional means. Package them and give them to your local municipality’s hazardous objects disposal unit. You can recycle empty aerosol cans but get rid of the lids. 3.All bathroom cabinets have a few of these. You cannot dump them in your regular garbage or recycling cans. Place used needles and syringes in a labeled sealed container and drop them off at the hazardous waste depot. 4.Use old toothbrushes to clean your jewelry, the spaces between your bathroom tiles and hard to reach cupboard corners. Buy liquid soap refills and fill up your old soap dispensers instead of buying soap in plastic dispensers. 5.Use leftover shampoo to clean bathroom tiles and your tub. 6.Use your heavy-duty hair brush as a scrub brush; you can use it to clean recycling and garbage bins and muddy shoes. 7.Single use plastic razors and blades add a great deal of non-biodegradable waste to the environment. Buy reusable razors to prevent this. Over 2 billion disposable razors make their way to landfills every year, according to the US Environmental Protection Agency. 8.Don’t use disposable cleaning cloths that are usually made of paper. Unless disposed of properly, these can clog drains and sewers. Use cotton washcloths instead and reuse them as much as you can. 9.Recycle empty shampoo, conditioner and body wash bottles, as well as empty toothpaste tubes. 10.If you have small plastic bottles, pour leftover shampoo or hand wash liquid soap in them. Keep them in your purse or bag to use on the go. 11.Use old shower curtains as a paint and waterproof cover for your table when your kids do their arts and crafts. 12.Old shower curtains can be used to create garden tents for your children to play. 13.Use old shower curtains to keep the sun and the wind off your delicate shade plants. 14.Use facial tissue boxes and toilet paper rolls to make arts and crafts. Donate these items to local schools for their craft projects. 15.If you have extra spray or pump bottles, clean and fill them up with a fourth of vinegar and a teaspoon of baking soda. You have a ready to use, homemade glass and window cleaner. Once you’ve cleaned up your bathroom and recycled everything you can, it’s time to think about what you can do to ensure you don’t buy similar stuff again. Here are a few smart shopping tips for an eco friendly bathroom. 16.Buy aerosols such as hair sprays and deodorants that come packaged in recyclable containers. You can find these at health and organic stores, as well as in brand name pharmacies. 17.Buy razors and toothbrushes that are made out of 100% recycled material. Some environment-conscious companies even send you a postage paid envelope for returning the product when you’re ready to recycle it. 18.Order all natural, environmentally friendly bathroom products from Grassroots, a company that packages its products in recycled plastic containers. 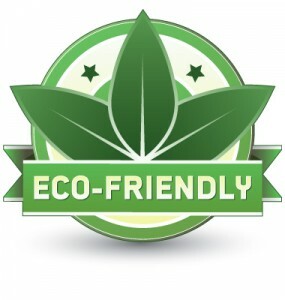 19.Order environmental friendly, organic cleaning liquids, toothpastes, sprays and other items from planet-aware companies such as Amway and Nature clean. 20.An alternative is to make your own household cleaners, or buy homemade cleaners from homemakers.com and similar outlets. 21.Buy tissues and toilet paper made out of 100% post-consumer recycled material. Restricting the use of water in your bathroom is perhaps the most eco-friendly thing you can do. 22.Install a gray-water recycling system to ensure that water from your shower, tub and sink water are recycled for use in your garden, lawn and garage. 23.If you don’t have a recycling system, it’s best to conserve water using any method possible. Take baths instead of showers and use the bathwater to water your plants and shrubs, and to clean your car. 24.Use a single mug of water to brush your teeth instead of keeping the faucet running. 25.Wipe your face down with wet cloths instead of splashing lots of water on it. 26.Reduce the number of times you flush your toilet. 27.Fill your tub to the recommended level so there’s no excess seepage after you’ve stepped in. 28.You can get two kids to bathe together in a single tub, to save one person’s bathwater. 29.Scrub your bathroom tiles with a mixture of vinegar and baking soda instead of water and soap. 30.Install a waterless toilet in your bathroom. Every morning, millions of workers across the world commute to their place of employment. Whether by bus, trolley, train or auto, the need to get to work hits everyone hard in a depressed economy. Join us in exploring ways to implement eco-friendly work from home tips, or to become more cost-effective working outside the home. According to the Bureau of labor Statistics, U.S. fuel prices rose 1.9 percent in August 2011, after a 4.7 percent increase the previous month. Over the past 12 months, the gasoline index has increased 32.4 percent. It goes without saying that taking the most direct route to work is most cost-effective, fuel-wise… but planning your commute to enable timely stops to the market or to pay bills on your way to or from work can save money as well. Following a pre-planned route not only saves money and fuel – it also reduces your carbon footprint while trekking to and fro to run errands. Many people make attempts to save money on workday lunches and coffee stops, but fail miserably due to pressure from their workmates, and on-the-job stress. It’s easy to go out to lunch each day, or hit up the coffee barista on your way to the office, but not exactly cost-effective. It’s not eco-friendly either, when you take into consideration the piles of carry-out cups generated by take-out lunches and coffee kiosks. Brewing your own coffee or tea at home each morning is the obvious solution – and getting up early enough to eat breakfast can help control the urge to snack (or waste money!) If you’re a coffee drinker, purchase a programmable coffee maker, which will have your morning brew ground and steaming hot when you get out of bed every morning. Set it up the night before, to save time. Pare down your weekday expenditures by planning one day a week to eat lunch out of the office with your co-workers. Your wallet will thank you for it! Shopping over your lunch hour can rack up mounds of debt, simply because impulse shopping involves random purchases of merchandise we have little need for. If you know your weakness is window shopping (with the end result being a purchase each day) then enlist a co-worker or friend to support your noontime stroll – and to keep you accountable. There’s little harm is confiding in a friend… explain that you’re trying to stick to a budget but you also really enjoy stepping out of the office for fresh air every day. Perhaps bringing a pair of sneakers is the healthy solution in this case: begin walking – a steady pace is time enough for a brief glance at retail storefronts – and reap the benefits by losing a few pounds or toning up! Is your office eco-friendly? Does the organization you work for actively practice earth-friendly ways to save money and energy? If not, help spearhead a workplace initiative to make the office a greener place to work. Eco-friendly solutions like compact fluorescent or LED lighting and solar heat can save thousands each year. Other office place tips include reprogramming the office thermostat, implementing a ‘bring-your-own coffee mug’ policy for the break room, avoid printing documents that could just as easily be emailed, and instituting a recycling program for paper throughout the office. Offices who have replaced aging desktop computers with laptops use up to 70 percent less electricity and generate less heat waste. Many businesses have found that allowing employees to telecommute not only reduces fossil fuel use, but makes for more productive employees as well. Every commute not taken saves on money and time – and allows employees freedom in juggling family and career. If a telecommuting policy has yet to be implemented by your employer, approach the idea with a concise plan that spells out exactly how you will operate on your day(s) working outside the office. Set goals and agree to criteria which the plan can be measured against to prove success. If your office doesn’t condone telecommuting, and you feel you have the skills or talent to make it work, then perhaps supplementing your income by blogging, freelancing, or working as a virtual assistant could propel you towards self-employment. Saving money in the workplace and by making a conscious effort to implement eco-friendly options is an option that more employers are undertaking each day, internationally. Spending wisely and reevaluating your commute or work habits can save enough to allow you to plan for a vacation, or save more for retirement. Do you want to clean green? When strangers asked me what I do for a living, I liked to joke that I spent my day I scrubbing toilets. (Which, of course, I do.) For some people, this is the most dreaded cleaning job, but strangely enough, toilets are (generally) one of my favorite things to clean. Porcelain looks so nice when it sparkles. With toilets, the biggest cleaning challenges are: drips on the rim, down the outside of the bowl, and all over the floor from careless male users; spatters on the inside of the bowl; build-up below the water line from “letting it mellow” (which can occasionally lead to very severe gunk + lime scale); mold growth on the tank. Dump a bunch of toxic, corrosive chemicals into the bowl. Let sit, scrub and flush. The toilet brush is your friend. Buy a good one – that will reach under the rim, and deep inside the “exit passage”. Replace brushes as soon as they start to wear out – exposed brush wires can permanently scratch the inside of the bowl. And make sure the brush you choose has a large, stable base in which to rest when it’s not in use. That puppy will be germy, and will drip water all over your bathroom floor otherwise. To cut down on extreme toilet maintenance, encourage all toilet users to scrub the bowl whenever they create a “mess”. They know who they are, and what they’ve done. This kind of thing is SO much easier to clean up when it’s fresh, rather than after it’s been allowed to dry – at which point it will require all sorts of curse-inducing elbow-grease. Once every week or two, give the inside of the bowl a thorough scrub. There are eco-friendly toilet bowl cleaners on the market, but I never bother with them. If you want some suds, squirt in some eco-friendly dishwashing detergent. And don’t fret about finding a replacement for the traditional chlorine bleach toilet cleaners. I mean really – how long do you think that toilet is going to remain “germ free”? If you want to disinfect the brush between uses on the other hand, spray it well with vinegar and hydrogen peroxide (see detailed instructions in the posted item on disinfecting with vinegar and peroxide). You can even keep the brush soaking in hydrogen peroxide when it’s not in use. It’s much preferable to soaking the brush in chlorine bleach, which is highly corrosive and could be a hazard to pets and small children. Note that continually soaking a brush will often cause rust damage to the brush, though – and you will have to replace the peroxide frequently, since it naturally loses its potency upon exposure to air and light. To clean the rim, seat*, bowl sides and tank, liberally spray them with vinegar (or use the vinegar/peroxide disinfection technique), let sit for a few minutes, and wipe dry with a clean, dry rag. DO NOT CROSS-CONTAMINATE SURFACES by using the rag for anything else afterwards. It goes straight to the laundry room, okay? And wash your hands immediately after cleaning any toilet. *If you have a painted wooden seat and lid, be aware that vinegar can etch the finish. Don’t let the vinegar sit after spraying, but wipe it up immediately with a dry rag. Flush after every use. If you’re worried about water consumption, replace your old toilet with a newer, low-flow or dual-flush one. “Letting it mellow” – even just overnight – causes the worst build-up of unspeakable gunk below the water level. I’ve read that slipping a 1000mg tablet of vitamin C (or a package of citrus drink crystals) into the bowl and letting it sit for several hours will help prevent lime scale build-up. It’s the ascorbic acid that does it. Don’t pee into the acidic water, though – a toxic vapour may result. Some toilets will develop rust stains starting underneath the rim at the water holes, and spreading down the inside of the bowl. Alternatively, you can put off cleaning a toilet so long that a thick, gross-looking lime scale develops, usually creeping up from the outflow hole. Both can be treated by a (toxic and corrosive) commercial-grade calcium, lime and rust remover. I have yet to find an eco-friendly alternative to these extreme problems. Another challenge in some bathrooms is a pervasive urine smell around the toilet. I don’t like to point fingers, but the blame for this always rests with men in the household who stand to pee. Urine that “misses the mark” can seep underneath the toilet, and urine spray in the air can spread to the walls and underneath the toilet tank. I’ve noticed this is a special problem in wallpapered bathrooms where the paper absorbs the urine, and the smell is almost impossible to remove. With a damp cloth, thoroughly wipe down all surfaces surrounding the toilet, including the underside of the tank. Spray vinegar and hydrogen peroxide into the crack where the toilet meets the floor. Teach your men to sit when they pee. If you have pets then there are a number of reasons why you should consider all natural cleaning. The truth is that there are now more and more cases of problems such as cancer or behavioural disorders in animals that could be coming about as a result of taking in harmful substances from our cleaning products. Animals all react differently to different cleaning ingredients, and cats specifically find it hard to get rid of toxins from their body. And the truth is that the household cleaners we traditionally use are absolutely full of these toxins that can do more harm that good. Not only that, but bug spray and garden products are also just as bad. If you’ve read this site before then you’ll know that the ingredients in our cleaning products are bad for human health as well as animals. However, the reason why they may affect animals in a more obvious way is due to the fact that they inhale a higher concentration than we do given their body weight – they will be poisoned a lot more quickly than we will. If you notice any of these symptoms then it’s important to get expert help for your pet as soon as possible. The truth is that sometimes the symptoms may not be so obvious, but by choosing all natural cleaning products you’ll really be taking an effort to protect your pet’s health. It’s also important to bear in mind that even natural cleaning products can cause sickness and other problems, so always store them out of the way of your pets. Also try to avoid anything that includes natural fragrance, or use them in small doses to test how your animal reacts. In general, only use products that are fragrance-free. You should also avoid the use of essential oils, as when cats inhale these they can become poisoned. These factors aren’t meant to scare you, they’re just supposed to give you another reason to start using all natural cleaning recipes in your home today! If you have time, you may want to save lots of money and make your own cleaning products. It’s actually incredibly easy and fun, and it will not make your home look or smell like a dingy hippie commune. I use a mixture of the store-­bought eco-cleaners and my own. Most importantly, you can save a lot of money. 1. White vinegar—see the section on vinegar below. 2. Baking soda—eliminates odors and is a good scrubbing powder. 3. Borax—removes dirt; is antifungal and a possible disinfectant. 4. Hydrogen peroxide (three percent concentration)—nontoxic bleach, antibacterial agent, and stain remover. 5. Lemon juice—grease cutter and stain remover. 6. Liquid castile soap—all-­purpose cleaner, grease-cutter, and disinfectant. Castile means that the soap is vegetable-based and not animal fat–based. 7. Olive oil—makes great furniture polish. 8. Essential oils of lavender, geranium, and tea tree—antibacterial and add a great smell to your home. I have a passion for this strong-smelling essential oil from Australia. It is a natural solvent and is brilliant for cutting grease while killing germs and bacteria. They actually swab down hospitals with it in Australia. It also has a variety of health benefits: I put it on sores and cuts; in shampoo for dandruff; on bleeding gums; and dilute it with water for a mouthwash. Be careful that you’re getting the real thing—it comes from the Melaleuca alternifolia plant. There are at least 150 species of the Melaleuca plant, but only the alternifolia one has the healing properties that you need. So check the label. Also, take a whiff before buying, as it should have a very strong smell. You want to make sure it hasn’t been diluted. Buy organic if possible. Most large health food stores and many drugstores now stock it. With the favorite saying that two minds are better than one AZM Cleaning Services would like to announce we have partnered up with a Houston Texas company called Krystal Klear Windows & Cleaning Services you may visit their site HERE Please note this does not change our outlook of our company. The partnership is for both companies to be able to provide you with better prices and a wider range of services that we may offer you so if you own properties in Maine or Texas we will be able to cater to your needs. There are basically two kinds of stains on painted walls: oil- and waterborne. Benjamin Moore’s Carl Minchew suggests taking a wet cloth or paper towel to the waterborne ones — wine, Jell-O, ketchup, mustard, even smashed mosquitoes. For oily stains — cooking grease or crayon — try using a little mild dishwashing soap mixed in with water, and then rinsing with water. 30 Day Risk FREE Trial of AZM Office Cleaning Service is now available to prospective customers in Southern Maine. Southern Maine USA January 9 2012. Finding reliable and dependable Maine Janitorial services can be a difficult assignment. Many fly-by-night janitorial companies focus on doing the bare minimum when it comes to performing their cleaning duties and some, fail to do the job at all. The BBB (Better Business Bureau) is flooded with complaints about janitorial firm’s dodgy reliability among other distasteful tidbits such as theft, compromising security, and simply not delivering on their agreement. Most, looking to hire outside janitorial services often look past obvious red flags with poor customer service heading the list. Simply having cleaning supplies and a vacuum is not enough to perform professional janitorial services. The staff must have integrity, honesty, and professional office cleaning skills far beyond typical home cleaning skills. What Makes AZM Janitorial Services Lead the Pack of other Southern Maine Office Cleaning Services? Strong work ethics and prompt service has firmly placed AZM Janitorial head and shoulders above other Southern Maine office cleaning services. From the first encounter, the trained, professional and caring staff handles each customer with special, personal attention. From the initial phone call through the preparation of a custom janitorial proposal the customer understand that AZM is a company operated by a caring executive team and a highly trained staff under the umbrella of 10 prestigious years in the janitorial business. Every service appointment is kept and the service is rendered professionally, quickly, and to the satisfaction of each customer. AZM also follows up with monthly report cards and “easy to reach” customer service to insure that client’s expectations are exceeded. AZM Janitorial provides various pricing plans based on office size and frequency of cleaning. They provide plans tailored to the needs of each customer with 24 hour coverage. AZM Janitorial also offers prospective new customers a chance to experience 30 Days Risk FREE Office Cleaning Service full service, premium office cleaning services, simply to let the customer experience for themselves the difference AZM Cleaning makes. In this free 30 Days Risk FREE Trial, the customer’s facility is cleaned so thoroughly that, many have said, their office was cleaner than the day they moved in. All of this is delivered without obligation, courtesy of AZM Janitorial Service. How do you get your 30 Day Risk FREE Trial. Office Cleaning Service for your office? Simply visit http://azmcleaning.com. Request a quote, or for immediate service, call 207-282-5929 and introduce yourself to the finest janitorial service in the Southern Maine area.